In 57 games for the M-Braves, the then 19-year-old batted .326 with nine home runs, 30 RBI and 19 stolen bases. 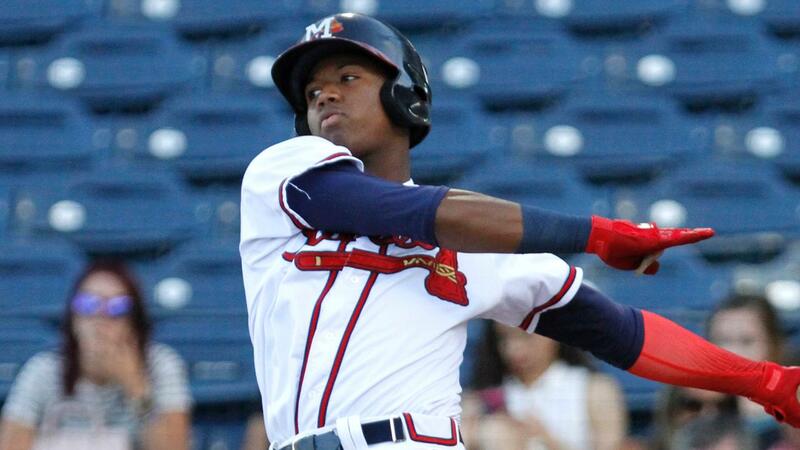 PEARL, MS - 2017 Southern League All-Star and Mississippi Braves alum Ronald Acuña Jr. claimed the National League's Jackie Robinson Rookie of the Year Award on Monday night after helping lead the Braves to the postseason in his first campaign. Acuna received 27 of the 30 first-place votes. Nationals' outfielder Juan Soto and Dodgers pitcher Walker Buehler were also finalists. Acuña appeared in 111 games hitting .293 with 26 home runs overall. Acuna debuted on April 25 and the Braves won seven of the first eight games of his career, going from 3 1/2 games out to 1 1/2 games up in the NL East during that span. The 20-year-old took off after the All-Star break, batting .322 with 19 homers, 15 doubles, and four triples. A move to the leadoff spot in the batting order helped jump-start the Braves' offense and Acuña delivered a franchise record with eight leadoff home runs. He's one of five players in history to hit 26 home runs before his 21st birthday and the 10th to have at least 25 homers and 15 steals during his rookie season. Acuña hit .325 with 21 homers, 82 RBIs and 44 stolen bases across three levels in 2017 to earn Minor League Player of the Year honors from USA Today. He was MLBPipeline.com's Hitter of the Year and earned a spot in the All-Star Futures Game - then wrapped up the year as the MVP of the Arizona Fall League. Acuña was also recognized by the Braves as the Mississippi Braves Player of the Year and took home four Player of the Week awards in 2017. Acuña was promoted to Mississippi on May 9, 2017, after hitting .287 with three doubles, five triples, three home runs, 19 RBIs and 14 stolen bases at High-A Florida. The higher level didn't deter his production as he was named Braves' organizational Player of the Month during May after posting a .415 batting average with seven doubles, a triple, three home runs, and 15 RBI for the M-Braves. In 57 games for the M-Braves, the then 19-year-old batted .326 with nine home runs, 30 RBI and 19 stolen bases. Acuña was one of seven players, including three 19-year-olds (pitchers Kolby Allard and Mike Soroka, plus Acuña) represented the M-Braves at the 2017 Southern League All-Star game in Pensacola. Acuña and Reds prospect Gabby Guerrero treated fans at Blue Wahoos Stadium to an epic display of power during the Southern League's home run derby. It took three rounds and a tiebreaker rule, but Guerrero just edged out Acuña, 27-26. Acuña is the second Mississippi Braves alum to be named NL Rookie of the Year, joining pitcher Craig Kimbrel in 2011. Since the club's inception in 2005, 140 Mississippi Braves players have gone on to make their Major League debut, an average of ten per season. A total of 11 former M-Braves made their MLB debuts in 2018, including Acuña. The M-Braves will open the 2019 season on the road against the Tennessee Smokies, April 4-8, before commencing the 15th season at Trustmark Park against the Mobile BayBears, April 10-14. 2019 Season Tickets are on sale now! For more information, call the M-Braves Front Office at 601.932.8788 or 888-BRAVES4, or visit www.mississippibraves.com. Individual tickets start at just $6!